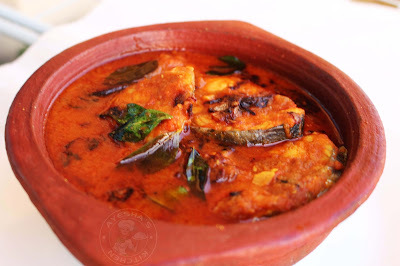 I have been trying to share this spicy fish curry for long. Last week, i got some fresh king fish steaks and so i decided to share you that spicy treat with you. It is very simple and heavenly delicious to have some fresh fish curry paired with steamed rice. But it is such a big task to hold fresh fish daily in UAE when compared to my native place Kerala, India. Still i somehow managed to get fresh fish these days instead of frozen fish. I know most of my readers are spicy food lovers especially fish and chicken recipes. Thank u all for your continuous support and encouragements which makes me to spent more in this blogging world. Still many are requesting me to add some spicy fish recipes. My family loves fish recipes when it is done with fresh fish but hated it to the core when it is done with frozen fish. This is the only reason am awkward in fish recipes. 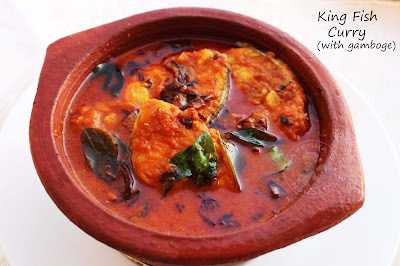 Fish curry / fish gravy recipe is my all time favorite curry recipe for lunch when i was at my home town. Each day, i used to prepare some unique and flavorful recipes with fish which makes me feel nostalgic when we back to UAE after the long summer holidays. Well, lets move on to the recipe. 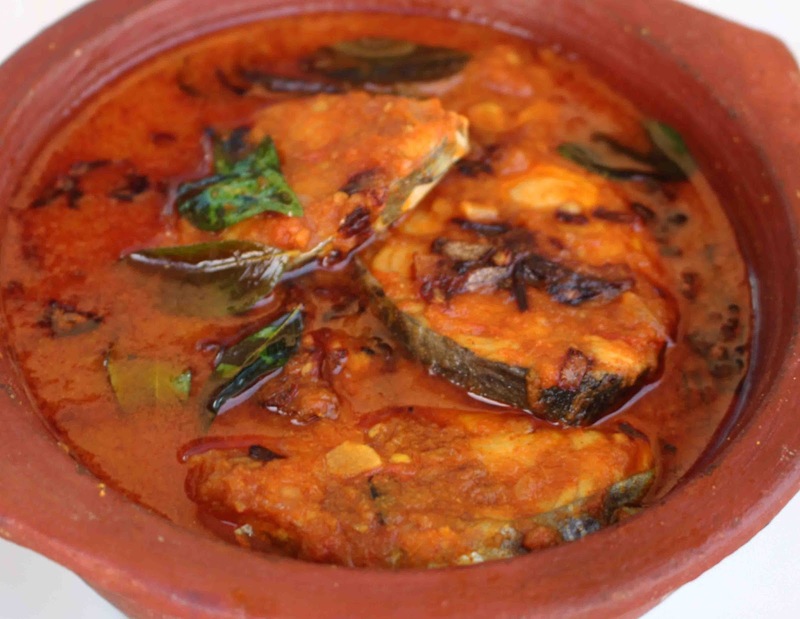 Indian fish recipes will taste different in different households depends upon their attitude and style in cooking. This red fish curry recipe is inspired from Kerala recipes which are well known for fish / seafood curry recipes. This recipe for fish is hot and spicy with unique taste. 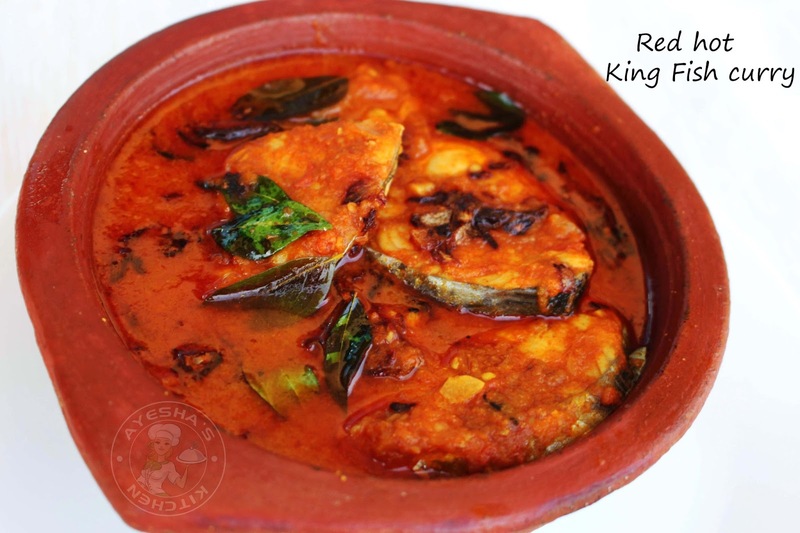 Here is the recipe showing how to make king fish restaurant style gravy / fish curry indian / curry fish recipe / kingfish recipes / meen kuzhambu / meen mulakittath / Ayakoora mulakittath /seafood recipes / simple fish recipes. Enjoy. Please drop your comments or feed backs. NOTE : Gamboge (kudampuli) which i used here is homemade and is thinly sliced. As it is less sour when compared to store bought, i added more slices of gamboge for this recipe. 3 medium sized sections is enough when it is store bought gamboge. You can also use lemon sized tamarind soaked in hot water instead. Wash and soak gamboge(kudampuli) in half cup of hot water. Set aside. Wash the king fish steak or fish slices and set aside to drain the excess water. Meanwhile, make a paste of onion in a grinder with less water. Once the garlic and ginger is done, add this onion paste to it. Cook until it goes slightly golden. Then add the tomato paste (grind the chopped tomato without adding water to a smooth paste) and saute well. Let it cook for few minutes. Then add the spice powders (turmeric, coriander and chili) and combine very well. You can add few drops of water if the gravy is dry. Let it cook for a minute. To this, add the gambooge along with the soaked water and mix well. Add salt. Bring to boil. Then add 1.5 cups of hot water and close the lid. Cook it until oil floats on the top. When done, add curry leaves and give a fine mix. Lower the heat and add the fish slices or king fish steak. Swirl the wok or pot to mix. Cover and cook on a low flame for 5 - 8 minutes or until the fish is cooked through. Check for seasonings and adjust salt. Swirl the pot to mix instead of stirring with a ladle. For seasoning, heat a pan with 2 tsp of oil. Fry shallots and curry leaves until golden and crispy. Pour this over the prepared curry.